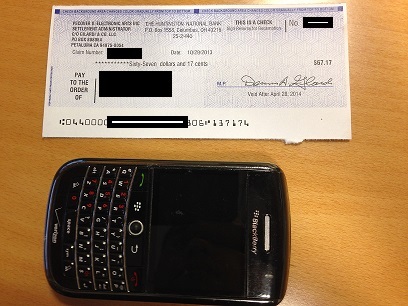 EA Sports settlement checks are barely bigger than a Blackberry. Electronic Arts began distributing its settlement checks related to the class action lawsuit regarding sports video game monopolies. In the matter of Pecover v. Electronic Arts, Inc., EA reached an out-of-court settlement in the tune of $27 million. If you filed a claim by May 15, 2013 you should be receiving your settlement check valued by the number of games purchased from the Madden NFL, NCAA Football and Arena Football game franchises for GameCube, Wii, PS2, PS3, Xbox, Xbox 360, and Windows PC. The exact terms of the settlement can be found here. NOTE: EA’s attorneys were very creative in the formatting of the checks. Each check comes in a postcard size mailing that could easily be mistaken for junk mail. The actual check measures roughly 6 inches x 3 inches with extremely small font. It almost doesn’t look like a real check. So much so, the phrase “This is a Check” is printed in small print before the check number. Issuing checks such as the one pictured above and mailed in not so clearly labeled mailings is a common and deceptive practice used in the hopes that claimants toss out the mailing without realizing it’s an actual check.